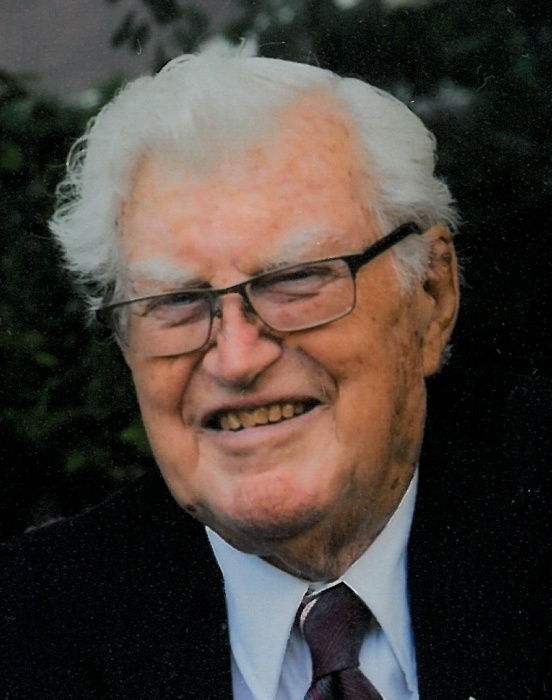 GLANDORF -- Jim Hohenbrink, 93, of Glandorf died 9:50 p.m. Monday, February 11, 2019 at the Meadows of Leipsic. He was born February 17, 1925 in Glandorf to the late John and Frances (Bockrath) Hohenbrink. On September 25, 1946 he married Wilma Recker, who survives in Glandorf. Also surviving are 3 children: Judy (Denny) Ellerbrock of Leipsic, John (Kim) Hohenbrink of Texas and Terri (Jerry) Niese of Glandorf; a daughter-in-law: Cheryl (Bruce McDaniel) Hohenbrink of Leipsic; 17 grandchildren: Troy (Dana) Ellerbrock, Jeff (Darlene) Hohenbrink, Brad (Cheryl) Hohenbrink, Greg (Marsha) Hohenbrink, Ashleigh (Chris) Kahle, Jeff (Amy) Rosengarten, Todd (Coreen) Rosengarten, Mike (Kim) Rosengarten, Melissa (Scott Eric) Donnelly, Brandon Hohenbrink, Brent Hohenbrink, Amy (Nick) Schmitz, Erin (Randy) Maag, Craig (Andrea) Niese, Jody (Chris) Fowler, Jeni LaRue, Jessica (Ryan) Hunsinger; 36 great-grandchildren; 3 great-great-grandchildren; a sister-in-law: Pat Hohenbrink of Ottawa and a special friend of his daughter Betty, Greg Inkrott of Fort Jennings. He is preceded in death by a son: Tony Hohenbrink, 2 daughters: Betty Hooks and Sharon Rex-Steyer; and a brother: David J. Hohenbrink. Jim retired from Ford Motor Company, Lima and was a member of St. John the Baptist Catholic Church, Glandorf. He was a member of the Ottawa K. of C. and the Ottawa Eagles. He always felt his greatest accomplishment was being married to the love of his life for 72 years. During his retirement years, Jim enjoyed traveling, gardening, creating wood working projects and enjoying his grandchildren's, great grandchildren's and great-great grandchildren's various sports, school and musical events. Jim was happiest when working with his scroll saw and his many projects are proudly displayed in his family's homes across the country. Those keepsakes will forever serve as a reminder of those who loved Jim of his passion for his family, his German heritage and his sense of humor. The Funeral Mass will be 10:00 a.m. Friday, February 15, 2019 at St. John the Baptist Catholic Church, Glandorf with Father Tony Fortman officiating. Burial will follow in the church cemetery. Visitation will be Thursday from 2 to 8 p.m. at LOVE FUNERAL HOME, Ottawa where a rosary service by the Ottawa K. of C. will be 7:30 pm. Putnam County Homecare and Hospice and Putnam County Council on Aging helped Jim the most during his final days. The family would encourage memorial contributions be made to these two organizations.